These grips are handled entirely different from the breast-grips, which were dealt with in the Sixth Part. 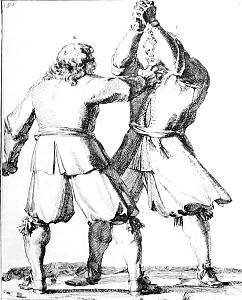 K grips L by the throat, and L, throwing off his hat, turns over his head to the outside, under the arm of K, so the hand of K is twisted such that he is unable, despite great pain, to apply force with it. 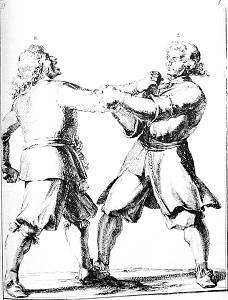 K grips L by the throat with the right hand, threatening to strike L with the left hand, feeling this, L throws up both arms, and strikes the same on the upper part of K's arm, forcing him to release his hold. K grips the throat of L, as in the previous plate. 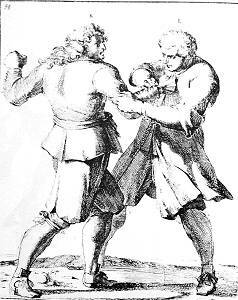 L again joins both hands, and strikes sideways against the elbow of K, breaking his hold. K again has L by the throat, who grasps K's attacking arm with both hands, placing the right hand on K's wrist, and the left hand behind the elbow, and bends the arm to the inside [it's not clear from the text who this arm belongs to, but I believe it to be K's] in such a way that it becomes almost impossible for K to free his hand. 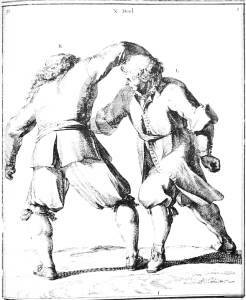 If L succeeds in breaking the grip of K, L will place this loose hand of K against his own breast, and sweeps under K's foot with his leg, or strikes K's manhood with his knee, which could inconvenience him considerably.